I think I mentioned that my son turned 6 this weekend. We decided to postpone his robot birthday party for a couple of weeks (and were able to take a fast but fun family getaway), but there was still some celebrating to be done! On Friday, I took goodies to his class at school to celebrate with everyone there. The difficulty is, that in Arizona (is it statewide?) we are not allowed to bring homemade food to class. No cupcakes, cookies, cupcake pops, or whatever else I may be tempted in my insanity to make. This rule may be saving me from myself and my insanity, but I have to admit, I feel kind of underwhelmed and uninspired bringing in a package of store-bought cookies and a jug of lemonade to the classroom (I’m way too cheap to bring in bakery cupcakes, and most of the teachers complain about the amount of frosting on those anyway). So in the middle of my robot party planning, I was struck with the brilliant idea, of taking in goodies to class, disguised as robots! 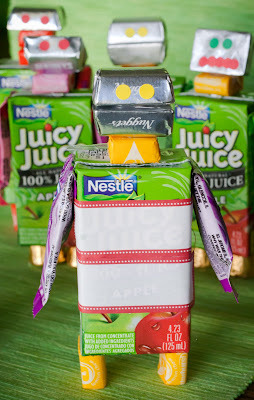 The initial inspiration came from the party favors that Crystal @ Little Bit Funky made for her son’s robot party. I thought it was a great idea and have purchased some supplies to make something similar for the friends that come to my son’s party. But the fun thing about robots, is that they can look a lot of different ways. Really they can look like anything, so you can use anything to make them! 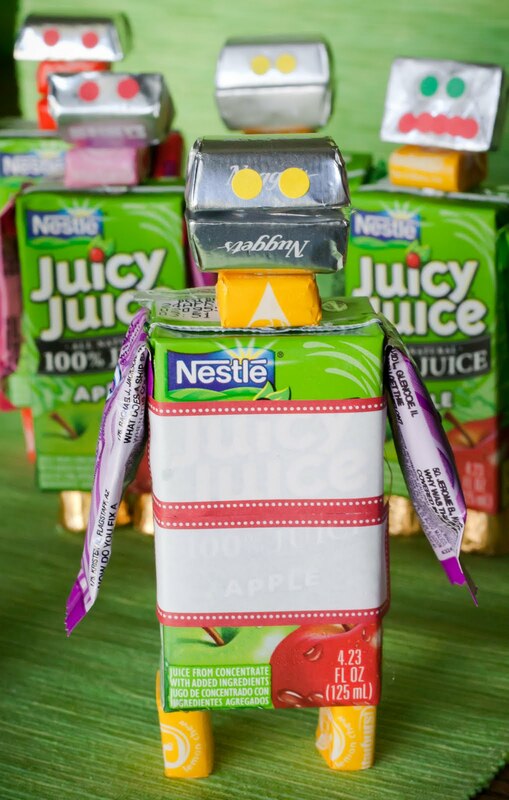 Keeping in mind that they are historically boxy, I thought a juice box would make the perfect body for the bots, and be easy to serve and clean-up. 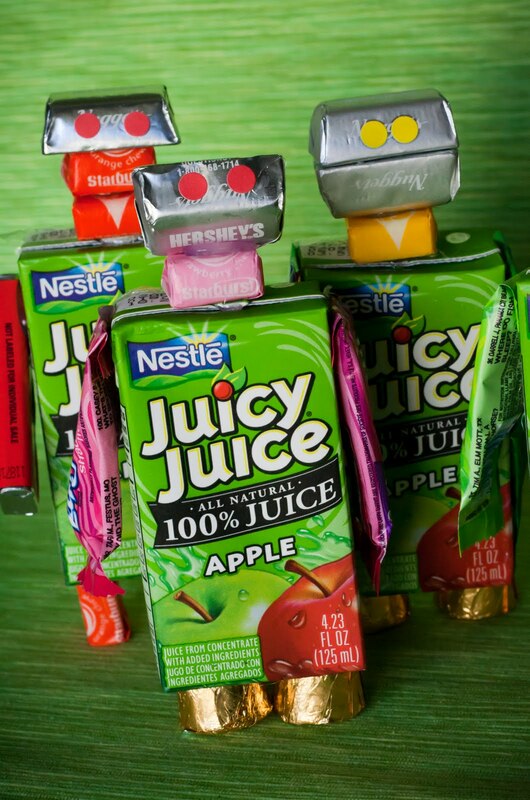 I chose the smaller juicy juice boxes, partly because they are 100% juice (have to make up for the candy overload they are getting), but mostly because they are green, and my son is on a green kick lately. It will be one of the main colors of the robot party. I thought I might cover them up with a sticky label I designed, but couldn’t easily find the right sized labels around my house, and didn’t have another trip to the store in me. You can see on the photo on the right how it might have looked to cover up the branding, but I didn’t this time around. 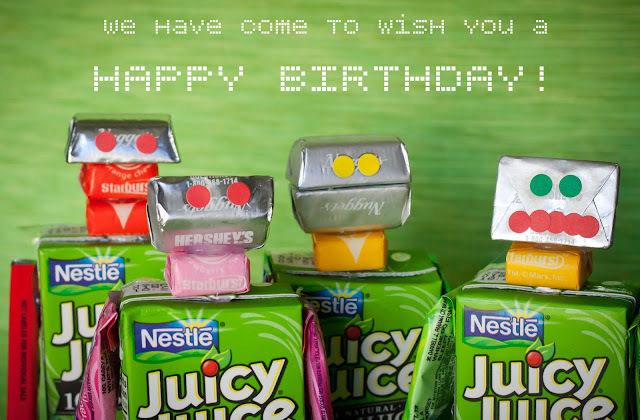 I had thought to do individually wrapped cupcakes/snack cakes for the head of the robot, but they were too big (and too expensive) for the size of the juice box. It took a bit of scouring the candy aisle, to figure out what would work best. 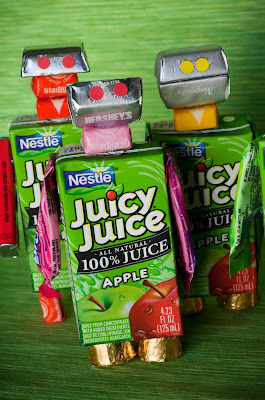 These Hershey’s nuggets were great, and I found several different ways I could attach them to make different robot heads. I used Starbursts for the necks and some of the feet. 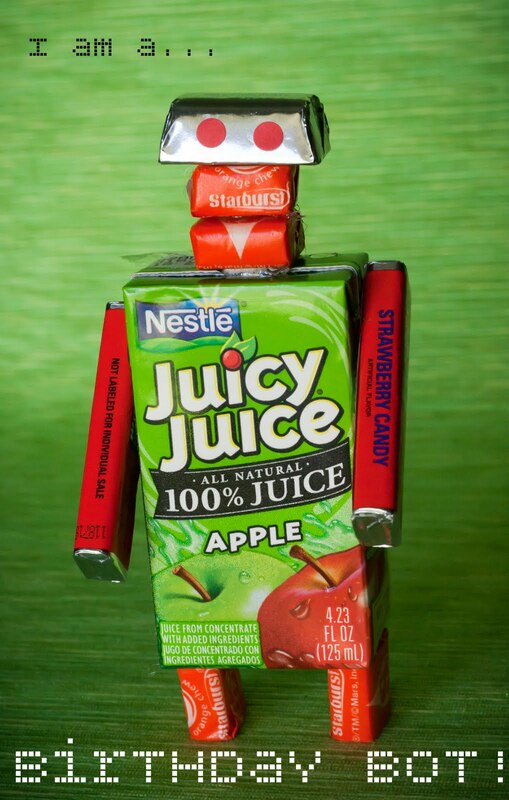 Most of the robots had Rolo feet, which looked great, but the Starbursts, were actually more stable for standing. For arms I used Laffy Taffy, Airheads, or Pez candy. The Pez clearly made the best arms, but they were really pricey, so I only did a few of those. When attaching the more floppy arms, I folded down the wrapper edge before gluing it to the box. I just used low temperature hot-glue to attach everything and added 1/4″ round stickers (available at Office Max and other Office supply stores) for eyes, and sometimes mouths. I had my kids help me pick out the combinations and add the stickers. The best part was how excited his school friends were. Before I took them out of the box, kids were identifying them as robots. When the teacher prompted them to tell me “thank you,” I got a “thank you… SO MUCH!” My son was thrilled! Now, to get his party put together. And I’ve got until April, to figure out how to spice up my daughter’s school birthday treats. Hmm…. that is a way cool idea. I may have to implement this in the future since most states in the East coast (that I lived in) also don't allow for home made goodies. So creative…can't wait to see what else you come up with for the party! So stinkin' cute! I LOVE them!!! This is so adorable! If I found one of these in my lunchbox I would be completely giddy. 🙂 Maybe I'll sneak one in hubby's lunch. Thanks for sharing your great idea! Posted your link on my FB page. It's the same everywhere! My daughter's 6th birthday is Friday and I'd love to make my homemade healthy cupcakes and I'm not allowed. To be honest, it's really stupid b/c I could just as easily poison store bought stuff as I could homemade stuff! HAHA Not that I would do that… just saying! However, your idea is FABULOUS! I love it. My daughter is a bit too girly for robots, but now you have my brain ticking as to what else I could make with sealed candies 🙂 Thanks for the inspiration! These area adorable and totally doable with my son's school! I love them! So fun! It's always hard coming up with boy stuff–and you nailed it!